See the Afghan Protest Timeline here. 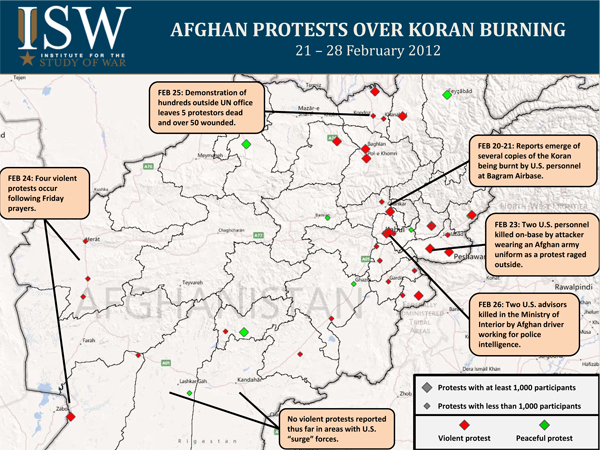 Protests emerged in stages across small regions of Afghanistan following the accidental burning of Islamic religious texts at Bagram Airfield on February 20, 2012. Most of the protests are not spontaneous or self-organizing outbursts of anti-Americanism, but rather organized violence orchestrated by insurgent groups, Iran, and Afghan political factions aiming to harm their local rivals. Neighboring Iran has utilized its media outlets, especially radio, to influence Afghan demonstrators to be destructive during their protests. The Taliban have issued multiple statements encouraging violent actions. President Karzai and his administration, in contrast, have actively tried to quell violence. Despite numerous Taliban statements attempting to incite the population, the U.S. counterinsurgency campaign has diminished the Taliban’s ability to mobilize the population. If the current protests were a burst of anti-Americanism, we would expect them to be occurring in areas where the Taliban has traditionally been strong and American forces are numerous. But this is not the case. There have been few demonstrations in Helmand and Kandahar between 21-29 February, and none of them has turned violent. The presence of significant forces, partnered with local Afghan government and religious figures, likely discouraged small protests from growing and becoming destructive – as well as providing much more regular contact with American troops. This stands in contrast to the destructive protests that emerged in Kandahar in the days after an American group led by Florida pastor Terry Jones burned copies of the Koran on 31 March 2011. The protests are, rather, concentrated in the East and North, where U.S. forces are sparser, the Haqqani Network is most active, and where local factional politics have provoked violence and organized demonstrations for many years. The hand of the Haqqani Network is visible. Most demonstrations have focused on ISAF or Afghan government installations, but many protests in eastern Afghanistan specifically destroyed police checkpoints and government vehicles. Most such instances occurred in Khost province and the Chamkani and Zadran districts of Paktia province, where the Haqqani network operates and runs a madrassa system. The Haqqani family is originally from Zadran district while Chamkani sits on a key cross-border route from Kurram Agency. The Haqqani network has been trying to reassert control in Chamkani after being partially disrupted by a strong Afghan Local Police unit operating there. In Jalalabad, there has been a multi-year struggle between provincial governor Gul Agha Sherzai, the historically powerful Arsalae family, and local tribes seeking independence from each. The Sherzai-Arsalae rivalry has led to targeted mafia-style violence in Jalalabad city. This ongoing competition between local powerbrokers, which insurgents exploit, has probably accelerated violent protests. In Khogyani district, which is one of the few insurgent strongholds in Nangarhar, two U.S. soldiers were fatally shot by an attacker wearing an Afghan Army uniform – suggesting that the attackers were insurgent-linked. Likewise, the protests in the Northern Provinces, particularly Kunduz, Takhar, and Baghlan, are familiar expressions of insurgent activity, political competition among rival factions, and Pakistan-based groups. Local religious leaders and itinerant imams, most of who were trained in Pakistan, have been the energizing force behind ethnically-mixed violent demonstrations in northern provinces such as Takhar and Kunduz, where the Haqqani Network and its affiliate, the Islamic Movement of Uzbekistan, are typically active. The lack of protests this year in Balkh province is significant, as its capital city, Mazar-e-Sharif, was the site of a large demonstration in 2011 during which protestors overran the UN compound and killed seven UN employees. The protest began after three imams encouraged worshipers to hold a demonstration during Friday prayers. The crowd, which grew to over 2,000 protestors, became violent and overwhelmed police and UN guards. The fact that Balkh province, which is the stronghold of Jamiat leader Atta Mohammad Noor, did not experience a protest in 2012 suggests that Noor learned his lesson and likely mobilized security forces to ensure he had sufficient manpower to deter any violent protests from forming. In Parwan and Kabul provinces, where the initial protests occurred, religious figures and select Members of Parliament (MPs) have been especially vocal in condemning the Koran burning and encouraging demonstrations against ISAF and Afghan security forces. Mawlawi Enayatullah Baleegh, an imam at one Kabul’s largest mosques who is known for speaking out against the Karzai government and coalition forces, told worshipers that the “burning of the Koran is an unforgivable crime and sin, but the presence of infidels in a Muslim country is an even bigger crime.” Political figures such as MP Mullah Tarakhel and Parwan MP Abdul Satar Khawasi, who are associated with Parwan powerbroker Mohammad Zahid Almas, have been actively inciting violent protests and demanding the withdrawal of international forces from Afghanistan. These political leaders oppose President Karzai and are seizing on this opportunity to advance their own agenda. Iran is stoking violence in Western Afghanistan. On Friday, February 24th, following weekly morning prayers broadcast from Iran, four violent protests occurred. Three were in the western province of Herat and the fourth was further south in Zaranj, a town in Nimruz province along the border with Iran, not far from Zahedan, where an element of the Iranian Revolutionary Guard – Qods Force is based. President Karzai initially released a statement denouncing the Koran burning incident, and it appeared that he would simply take advantage of the situation to push the U.S. to hand over control of prisons to the Afghan government – a key issue for which he is negotiating as part of the long-term strategic partnership agreement with the United States. However, once it became clear that violent protests had occurred in multiple locations and caused civilian casualties, Karzai called on the population to refrain from resorting to violence. He continued holding meetings with numerous groups of religious leaders to address their grievances and appeal for any demonstrations to be peaceful. Karzai has not reacted to similar circumstances in the past in ways that assist United States forces. In September 2010, a U.S.-based group led by Florida pastor Terry Jones had announced plans to burn the Koran. And when that group did in fact burn copies of the Koran in late March of 2011, he demanded an apology from the United States. In contrast, Karzai is working actively to maintain American and NATO support for the strategic agreement, and has even agreed to defer the discussions of the U.S.-run prisons while the remainder of the agreement is negotiated. Karzai’s strategic alignment with the United States and NATO in speaking out to contain the violence protests in 2012 has likely contributed to the diminishment of protests in the past three days. The United States’ recent reaffirmation of its commitment to Afghanistan and its transparent investigation into the incident will likely contribute to the further reduction of protests across Afghanistan. Isaac Hock and Paraag Shukla are Research Analysts at ISW.